Francisco Liriano made his final spring start yesterday afternoon, tossing six shutout innings versus the Pirates, and afterward the 26-year-old southpaw revealed that he's been promised the final rotation spot despite the Twins holding off an official announcement for now. Liriano created many doubts by going 5-13 with a 5.80 ERA in 137 innings last year, but turned heads by dominating the Dominican Winter League and kept rolling with a great spring training. Yesterday's eight-strikeout, three-hit outing against the Pirates leaves Liriano with a 2.70 ERA this spring and his 30-to-5 strikeout-to-walk ratio in 20 innings is incredibly promising. Better yet reviews of his raw stuff have been equally positive and he appears to have regained some of the velocity lost following Tommy John surgery in late 2006. Combined between winter ball and spring training Liriano racked up 97 strikeouts with just 12 walks in 68.2 innings. That dominance came against inconsistent, often mediocre levels of competition and even with some of his velocity returning Liriano isn't the unhittable phenom who overpowered the league with a mid-90s fastball, parachute changeup, and high-80s slider of death in 2006. However, his confidence has seemingly returned, he's throwing strikes with a far livelier fastball than we saw last season, and his slider/changeup combo still misses tons of bats. The jaw-dropping revelation of an ace from 2006 isn't coming back, but if Liriano stays healthy and continues to pitch like he has during the past few months he'll make for one hell of a fifth starter and could even be capable of re-emerging as a front-of-the-rotation option. Obviously the real test will begin April 9 against Chicago, but in the meantime I've gone from skeptical to cautiously optimistic about Liriano's progress and it's great to see him thriving again. We are a committee. Our closer role is a committee. We're going to try just about anything. I've never had to do it. It's going to be an experience trying to mix and match as best we can. But I've got some capable arms that we're going to rely on. I've seen committees work. It's not always the easiest thing in the world, but you just have to ad lib. When you lose your closer, it's a little different. That's how we're going to start, and we'll go from there. Aside from steroids there's nothing the baseball media freaks out about more than a team without a so-called established closer, so expect plenty of logic-be-damned overreactions if the Twins blow a couple leads early on. In fact, expect some of those reactions right now. 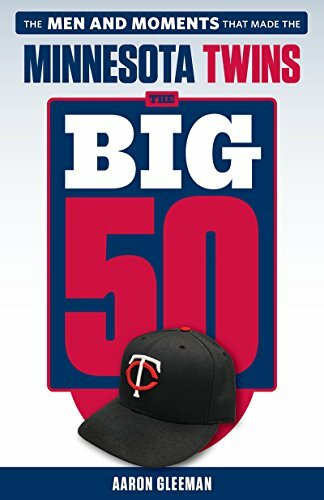 However, the odds of Gardenhire and the Twins sticking with a true committee approach to the ninth inning all year are very slim. Gardenhire has said multiple times that he wants to find one man for the job, so mixing and matching Jon Rauch, Matt Guerrier, Jose Mijares, Jesse Crain, and perhaps Pat Neshek early in the season will likely just be a way for him to determine the best fit for the role. I'd be surprised if a committee approach lasts longer than 3-4 weeks and, assuming the Twins don't trade for a veteran closer, would still bet on Rauch leading the team in saves. In the meantime we're bound to hear how monumentally insane the Twins supposedly are for treating the ninth inning just like the seventh and eighth innings, which shows just how wrapped up everyone is in a role built around the save statistic. I don't think Gardenhire will go with a true closer-by-committee approach for long, if at all, but the Twins will be just fine if he does. Baseball existed without a one-inning closer for a hundred years or so. For me, at 12 months there was no way I was ready to face hitters at that time. I don't know how guys come back quicker than that because it honestly was painful at that stage. Lots of scar tissue that would break up. I think they wrote my program to go slower so everything I did was set back a couple months, whereas a normal guy is around 12. Plenty of pitchers have returned from the surgery within 12 months and been effective, but I'd be very surprised if Nathan is able to do so at age 35. Incidentally, if you weren't already a huge Neshek fan his answering my questions about elbow surgery via Twitter at midnight on a Tuesday should make you one. After shopping around for a better deal all offseason Ron Mahay finally settled for re-joining the Twins on a minor-league contract last week. Mahay originally signed with the Twins in late August of last season after being released by the Royals, but pitched just nine innings down the stretch. Much like Jacque Jones he's apparently willing to accept an assignment to Triple-A, which makes Mahay a nice low-cost pickup as a potential lefty middle reliever. Along with Mahay, the Twins also signed 29-year-old Yoslan Herrera and 30-year-old Brad Hennessey to minor-league deals. Hennessey spent five years with Giants and even served as their closer for much of 2007, saving 19 games with a 3.42 ERA in 68 innings. He was let go after coughing up 35 runs in 40 innings in 2008 and then spent last season sidelined by elbow problems after agreeing to a minor-league contract with the Orioles. Herrera received a $2 million signing bonus from the Pirates after defecting from Cuba as a 25-year-old in 2006, but has been mediocre in the minors and allowed 20 runs over 18.1 innings during his only major-league stint in 2008. They both seem destined for spots in the Rochester bullpen and are solid organizational depth, but Mahay is significantly more likely to see time in Minnesota this season. I can't wait until I get my driver's license because I have to look for people who are 21 to get into my car and just go somewhere. I was thinking about getting a girlfriend who was 21, but that's kind of risky. I initially imagined that quote being said in a thick German accent, but then hearing Kepler's nearly flawless English during a radio interview with Patrick Reusse ruined the fun. Despite extraordinary minor-league numbers Anthony Slama didn't reach Triple-A until just before his 26th birthday last year and I've criticized the Twins for not promoting him more aggressively. However, while the front office may not have much confidence in Slama being for real both Gardenhire and pitching coach Rick Anderson indicated they were impressed by the right-hander who ranked 19th on my annual list of the Twins' top prospects. Acquired from the Mets in the package for Johan Santana and traded to the Diamondbacks for Rauch in August, Kevin Mulvey is now competing for the final spot in Arizona's rotation. Meanwhile, a groin injury is hurting Boof Bonser's bid for a bullpen job in Boston. Joel Sherman of the New York Post reports that the Yankees "made a series of attempts" to trade for Denard Span last season "only to be rebuffed each time by the Twins." Remember the lone voter who kept Joe Mauer from being a unanimous MVP? Well, suffice it to say you won't be satisfied by his reasoning. Nothing is official yet, but the Twins basically finalized the position player portion of their roster over the weekend by optioning Matt Tolbert to Triple-A and announcing that Jacque Jones will also begin the year in Rochester. Tolbert and Jones were both competing with Alexi Casilla for the final bench spot, but Casilla had a big advantage in that he's out of minor-league options and would have to pass through waivers unclaimed before going to the minors. I've all but given up on Casilla developing into an impact player. He'll turn 26 years old in June, doesn't have a great glove, and has hit just .244/.301/.314 in 903 plate appearances in the majors along with .278/.352/.350 in 703 plate appearances at Triple-A. Yes, he had a very nice half-season for the Twins in 2008, but he's too old to be a prospect, doesn't bring a ton to the table defensively, and has now been an awful hitter for the past 1,600 plate appearances. With that said, choosing to keep Casilla around as a utility man rather than risk losing him for nothing on waivers makes sense when the alternative is a similarly flawed non-prospect with a minor-league option remaining in Tolbert. Barring injury the last man on the bench will rarely see the field anyway, so this way the Twins keep both guys in the organization while delaying an inevitable decision on Casilla's future. Jones actually out-performed Casilla and Tolbert during spring training, but decisions shouldn't be based on a dozen exhibition games against inconsistent levels of competition and he hasn't been a productive big-league hitter since 2007. Beyond that he isn't on the 40-man roster, so the Twins would've had to dump someone like Casilla to create a spot for him. Instead they'll stash Jones at Triple-A and see if he plays well enough to be a potential in-season call-up. The combination of a 12-man pitching staff and Jim Thome's inability to serve as more than an emergency first baseman defensively already limited the Twins to essentially a 3.5-man bench. Compounding that issue even further is Jose Morales starting the season on the disabled list and the final spot going to Casilla rather than an outfielder. However, while that's certainly far from an ideal setup it shouldn't hurt the Twins much in the short term. Drew Butera will have an argument for being the majors' worst hitter, but Morales is aiming to return by the end of April and in the meantime he hopefully won't be called on for more than 1-2 starts each week. On days when Thome starts at DH the Twins will have an outfielder on the bench and presumably Casilla, Nick Punto, or Michael Cuddyer can handle center field for a few innings if necessary. Plus, beyond Punto the Twins won't do much pinch-hitting anyway. Sure, a healthy Morales would be preferable to Butera and an experienced outfielder would be more useful than Casilla, but ultimately Thome and Brendan Harris will take care of whatever mixing and matching Ron Gardenhire figures to do with the lineup. It doesn't make sense to rush Wilson Ramos' development just so he can back up Joe Mauer for a couple weeks and it doesn't make sense to ditch Casilla before getting further proof that Jones isn't washed-up. After more than seven years of using Blogger to run AG.com, last week's disaster-inspired switch to WordPress has gone pretty smoothly thanks to Than Tibbetts' hard work behind the scenes. Still a few kinks to work out, but I'm happy with how things are looking and the new setup should allow me to eventually do a lot more interesting stuff in terms of content presentation. Plus, now the RSS feed is actually fully functional. We're definitely still in overhaul mode and some stuff isn't quite right yet, but if anyone has suggestions for ways to improve the blog's layout, look, presentation, or basically anything aside from "write better" please let me know. Sure, the actual games are nice and all, but my favorite part of this year's NCAA basketball tournament might be the Gus Johnson soundboard. "Rise and fire!" Mila Kunis has not let her recent ascension to Official Fantasy Girl of AG.com go to her head and continuing to give 100 percent after receiving the greatest honor of her life provides an excellent example for Joe Mauer to follow after signing his $184 million contract. Would any Lost fans not watch a buddy cop spin-off show featuring Sawyer and Miles? Actually, some sort of high school drama starring Ben Linus wouldn't be bad either. I've likely spent several thousand dollars on lemon chicken from Leeann Chin, so the actual Leeann Chin dying at age 77 made me sad. As someone in the midst of yet another weight-loss effort, this news got my attention: After tipping the scales at 340 pounds Jets coach Rex Ryan recently underwent surgery to shrink his stomach. I've actually thought about doing that, but am literally too lazy and clueless to go through the necessarily steps. So far, so good losing weight the old-fashioned way this time around, as I'm down 50 pounds since February 1. One of my favorite stories this week is MLB.com beat writers Anthony DiComo and Jordan Bastian challenging each other to a half-mile race, which turned into a mini-event called the "Dot Com Dash" that raised some money for charity. You'd think the competition might have inspired me to challenge a fellow baseball writer to something, but even down 50 pounds I got winded just watching the video of their race. Surprisingly, there's apparently a limit to how excited people are about the new ballpark. I've spotted Cordova in White's videos before and they're apparently close enough friends that White feels free to goof on him non-stop for an entire flight. It sounds like HBO is canceling Joe Buck Live, which technically ran for nine months but might be the shortest-lived talk show of all time with a grand total of three episodes. Joe Buck is the only person who could make Chevy Chase feel good about his hosting career. Friend of AG.com and former KFAN staffer Phil Mackey officially joined KSTP-1500 as Patrick Reusse's sidekick this week. 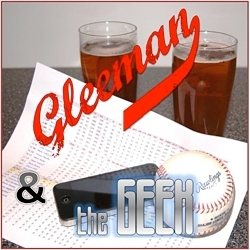 I was skeptical about the pairing, since they're about 40 years apart with an even bigger gap in preferred styles of baseball analysis, but after listening to the first show I think it could actually work. KSTP also hired Tom Pelissero of the Green Bay Press-Gazette to run its soon-to-be-revamped website and he comes with a good rep. I'm a huge fan of Scott Huff, Joe Stapleton, Jackie Bray, and the always entertaining "Two Jacks In The Hole" podcast, so check out the show's recently re-launched website for tons of good content. My weekly podcast-listening routine includes the aforementioned Huff, Stapleton, and Bray trio along with Adam Carolla, Bill Simmons, Joe Rogan, Kevin Smith, Ricky Gervais, and of course Seth Stohs. Any recommendations for other podcasts that are worth trying? Speaking of Carolla, there's a lengthy article about him in Fast Company magazine. Of course Leno still beats both of them in the ratings, which makes me sad about mankind. If you have a fantasy draft over the weekend please check out Rotoworld's award-winning Fantasy Baseball Draft Guide, which has up-to-date rankings, projections, and write-ups for 1,000 players along with a couple dozen strategy columns and all kinds of other good stuff. New blog to check out: That's Twins Baseball. - What kind of damage can Heyward do as a 20-year-old rookie? 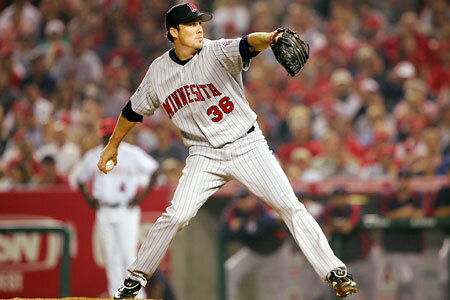 As expected Joe Nathan will have season-ending Tommy John elbow surgery to fix a torn ulnar collateral ligament, officially making that decision Sunday morning after feeling soreness during a highly anticipated game of catch with pitching coach Rick Anderson (only to have the news overshadowed by Joe Mauer signing hours later). Nathan and the Twins had hoped that a few weeks off would allow him to pitch through the pain, but that was always a massive long shot. Now the optimism is aimed at Nathan making a full recovery for next season, but as Francisco Liriano and Pat Neshek have shown recently Tommy John patients can have a true recovery timetable that stretches beyond the oft-quoted 8-12 months. Liriano underwent the surgery in November of 2006 and has a 5.12 ERA in 212.2 innings since returning, while Neshek took the mound again about 14 months after surgery and may not be 100 percent yet at 16 months. For every Liriano and Neshek there are also examples of pitchers who returned to the mound sooner than 12 months and didn't miss a beat, but at 35 years old Nathan seems an unlikely candidate to be one of them. He'll miss all of this season, there's a good chance he'll miss at least some of 2011, and his career is very much in jeopardy following a seven-season run as arguably the best reliever in baseball. As part of a four-year, $47 million extension signed in March of 2008 he's owed $11.25 million in both 2010 and 2011, with the Twins holding a $12.5 million option or $2 million buyout for 2012. Add it all up and the Twins have another $24.5 million committed to Nathan, which is a harsh reminder of the risks involved in handing out long-term contracts to even the very best players. However, insurance will reportedly cover as much as half of his salary for this season. There's no doubt that losing Nathan is a big blow to the Twins' playoff chances, but my hope is that they don't overreact by paying a premium for an "established closer" via trade. Closer is the most overrated "position" in baseball, as many people attach some sort of mythical value to the role despite the fact that the MLB average for converting ninth-inning saves is typically around 85 percent and elite closers like Nathan top out at around 90 percent. Beyond that, Nathan himself is an example of how most successful closers are failed starters, former setup men, or both. In fact, Nathan, Rick Aguilera, and Eddie Guardado all fall into the "both" category and rank 1-2-3 on the Twins' all-time saves list. Prior to thriving as closers for the Twins that trio had accumulated a grand total of just 26 career saves in 17 seasons as big leaguers, which coincidentally is the exact number of saves Jon Rauch has in seven seasons. Heath Bell of the Padres saved 42 games with a 2.71 ERA last season and is now being linked to the Twins as a possible Nathan replacement, but at this time last year he was a 30-year-old setup man with just two career saves. That he's now viewed as an "established closer" whose experience in the role is touted as evidence that the Twins should pay a premium for him via trade shows just how silly the whole notion is in the first place. Certainly there are some scenarios in which trading for a quality reliever could make sense for the Twins and depending on the cost involved Bell might even be a worthwhile target, but to overpay for that same quality reliever largely because he has "closing experience" that their in-house options lack would be a mistake in logic. Bell only has experience at closer precisely because the Padres focused on his ability rather than his save total one year ago. Truly replacing Nathan is impossible because he's a great reliever, but for closers the dropoff from "great" and "mediocre" is typically 3-5 blown saves, some of which still end up as wins anyway. Rauch, Matt Guerrier, Jose Mijares, Jesse Crain, and a post-surgery Neshek don't fit the description of an ideal closer, but the same is true for many pitchers who have success in the role. Hell, last year the best save percentage in baseball belonged to Fernando Rodney. Once you set aside the inflated, often hyperbolic importance placed on the closer role there's no reason to think that group can't produce someone capable of converting save opportunities at an 80 percent clip, which all but the disasters tend to manage each season with or without "closing experience." Bell is better than Rauch or Guerrier or Crain, but if the price tag involves Aaron Hicks, Wilson Ramos, or Ben Revere they're better off trusting the in-house options.